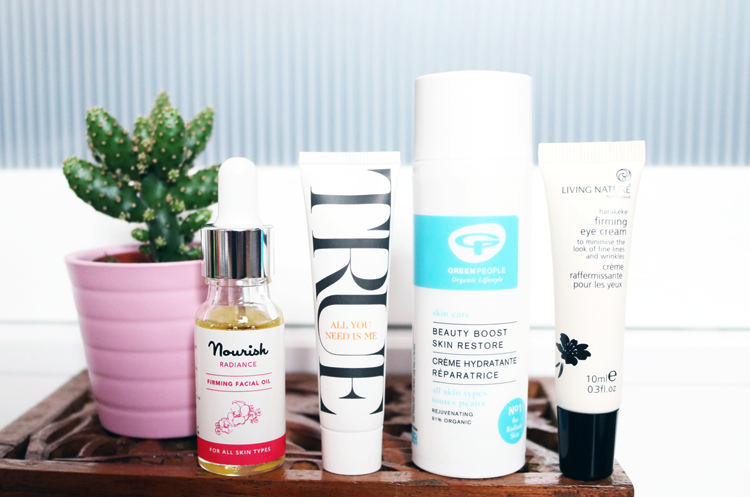 Looking for some 'green' skincare inspiration to shake up your Spring routine? Look no further, I've been trialling this lovely lot over the past month, which includes two shiny new releases from Nourish and Green People. Despite being a new product on the skincare scene, Nourish's latest face oil is already a winner of the Natural Health International Beauty Awards 2016 and having tried it out for myself, I can certainly see why it won! This face oil does what it says on the bottle - it gives a radiant glow to dull skin and it also has a slight firming effect. The oil is composed of a blend of Macadamia (lots of omegas), Pumpkin, Rosehip and Borage Oils, plus there's Geranium and Damask Rose Essential Oils which add a beautiful subtle fragrance that adds to the overall pampering experience. In addition, Nourish have added Marine Kalpariane and Frankincense which help stimulate collagen production and this aims to counteract some the signs of aging. Easily absorbed, suitable for all skin types, 98% ethically sourced and certified organic ingredients, vegan-friendly and cruelty-free. If you're in the market for a new face oil, give this a try! All You Need Is Me is a super intensive, multi-purpose balm/cream hybrid product that's 100% natural (95% of which are organic ingredients). It's made of only 6 ingredients; Castor Oil, Beeswax, Olive Oil, Shea Butter, Blueberry Seed Oil and Vitamin E. The result is a product that you can use on any seriously dry area such as cuticles, cracked lips, heels, elbows etc and it's great for things like soothing eczema flareups, reducing skin irritation and relieving minor sunburn. I've found it to be very effective on eczema and dry skin patches, with a little going a long way. One of Green People's newest releases is Beauty Boost Skin Restore which I feel a lot of people are going to be singing the praises of soon. This is being billed as a 'facial in a bottle' for those of us with busy lifestyles as it provides a handy quick fix for tired, dull and stressed out skin. Packed full of gentle but effective key natural ingredients such as Wakame (increases oxygen consumption which helps to form new collagen), Everlasting Flower (antioxidant rich that reduces impact of free radicals), and Green Marine Macro Algae (increases hydration and plumps/smoothes wrinkles and fine lines), Beauty Boost helps to restore brightness to dull skin and gives tired complexions the hydration it needs to look its best. I'm always quite sceptical about quick fix products, but I've really been loving using this once a week - there's just something about it that does what it says on the bottle and gives me a more noticeable, healthy looking glow! Hayfever season is unfortunately starting and I'm already sneezing as the fields start to be cut back for the first time in months (a-choo!). The skin around my eyes has always been on the sensitive side so I have to be careful with what eye products I use. If you're in the same situation, I'd recommend trying out Living Nature's Firming Eye Cream which is super gentle to even the most sensitive and irritated eye areas. This eye cream feels light but hydrating enough, absorbs into the skin quickly and has a slight cooling and tightening effect. It's 100% natural and uses Harakeke to firm, whereas Larch Tree Extract helps to lock in that all important moisture to keep dry under eyes perfectly hydrated. I like to use this as my morning eye cream as it creates that much desired smooth canvas for concealer application. A good one to pick up if your eyes need some extra TLC during hayfever season. What green beauty skincare products are you trying right now? Absolutely adore the Nourish oil! The True Organic Of Sweden All You Need Is Me sounds amazing!